Marigold has anti-inflammatory and antibacterial properties and is commonly used for strengthening the immune system. 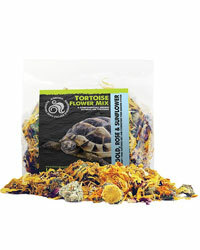 Dried rose petals provide a wealth of mineral elements and add a colourful and fragrant addition to a tortoises diet. Sunflower petals contain a number of vitamins that will help diversify a tortoises diet and are especially beneficial to the skin.